I recently finished reading Noah Charney’s new book The Museum of Lost Art. I have an academic crush on Charney’s work – he always manages to write about fascinating topics that I wish I had thought to write about myself. I’m glad that he is one step ahead of me, though, because he writes in a very engaging and approachable way. I wish that more art history texts were written like his. The book is divided into sections, and within each section Charney considers different ways for how a work of art can be “lost.” For example, some works of art are destroyed intentionally or destroyed accidentally, while others are altered from their original conception. Each section is tied unified by beginning and ending with an anecdote that relates to the topic. I found this to be a bit confusing when I read the first section, but then I perceived what Charney was doing and the remaining sections made more sense. I also was also intrigued to learn that part of Holbein’s painting The Ambassadors was “lost” at some point after it first was painted in 1533. 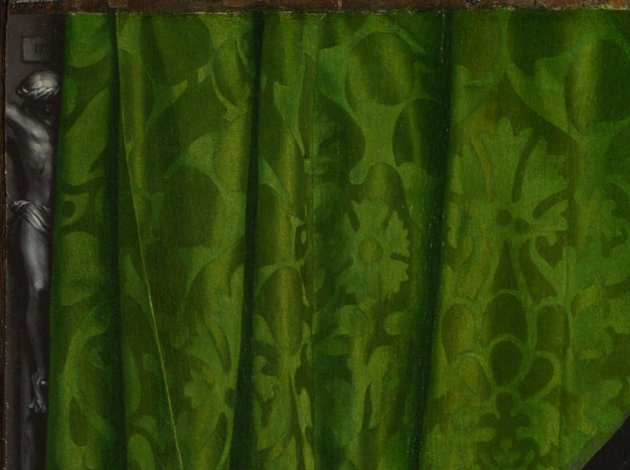 The crucifix in the upper left corner originally was created to be partially obscured by the green curtain (which has been connected to the political tension of the day), but at one point the crucifix was completely painted out. 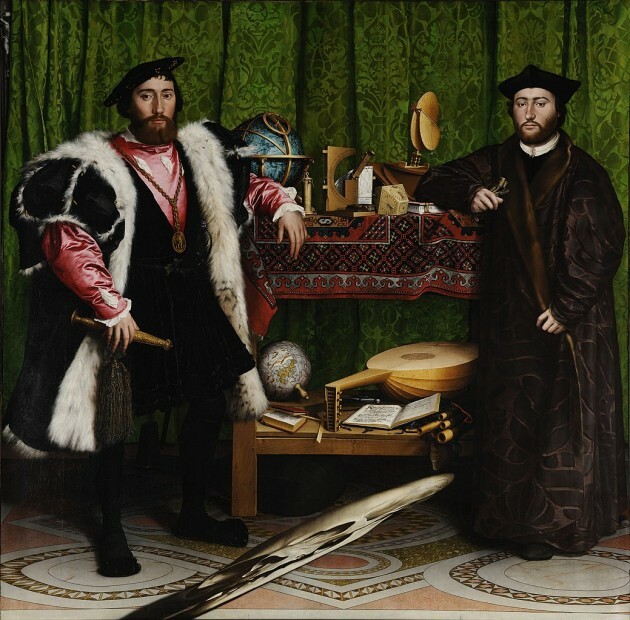 Only in recent times, when conservators at the National Gallery cleaned this painting in 1891, was the crucifix discovered.3 This clear alteration before 1891 suggests that this political message (which references Henry VIII’s break with the Catholic Church through the formation of the Church of England) was offensive or problematic. The only section that I wish had a little more attention in this book is that of the “Looting in the Ancient World.” I think that the ancient Near East could have gotten more coverage here in the book, since many works of art were altered or lost due to the different warring groups who lived in this area. Probably my favorite article which discusses this topic is Marian Feldman’s “Knowledge as Cultural Biography: Lives of the Mesopotamian Monuments,” which includes a discussion of the Akkadian King portrait head. I realize that Charney was giving a brief overview of this topic in his book, but I do wish that the ancient Near East could have received a bit more discussion. Otherwise, I really did enjoy this book and I heartily recommend it to anyone who is interested in the biographies of works of art, art crime, looting, conservation, and restoration. 1 Noah Charney, The Museum of Lost Art (Phaidon: New York, 2018), 215. I feel fortunate to have had the opportunity to read an advance proof copy of Susan Ronald’s forthcoming book, Hitler’s Art Thief: Hildebrand Gurlitt, the Nazis and the Looting of Europe’s Treasures. This book is slated to be published next month, on September 22, 2015. Ronald recounts and pieces together the story of Cornelius Gurlitt, a recluse who received a lot of media attention when over a thousand works of art were discovered in his Munich apartment in November 2013.1 Much of Cornelius’ collection was inherited from his father Hildebrand; the latter was an art dealer during the Nazi era who built his personal collection from the spoliation of museums and Jewish family estates. Susan Ronald’s book primarily is dedicated to telling the biography of Hildebrand, while simultaneously building up a broader context to explain the political and socio-cultural situation in Germany during WWI and WWII. As an art historian, I felt like the latter third of the book (about the last one hundred pages or so) was especially interesting to me. This part of the book discusses underhanded ways in which Hildebrand Gurlitt amassed his collection, which included one twisted state of events that enabled Gurlitt to not even pay for any of the paintings he claimed at an auction of the Georges Viau collection in 1942!2 More than anything, though, I wanted to learn more about the stories behind some of the paintings which were stolen. Although Ronald focuses mostly on historical events regarding Hildebrand Gurlitt and his son Cornelius, there were snippets of information on paintings that I particularly enjoyed in this book. 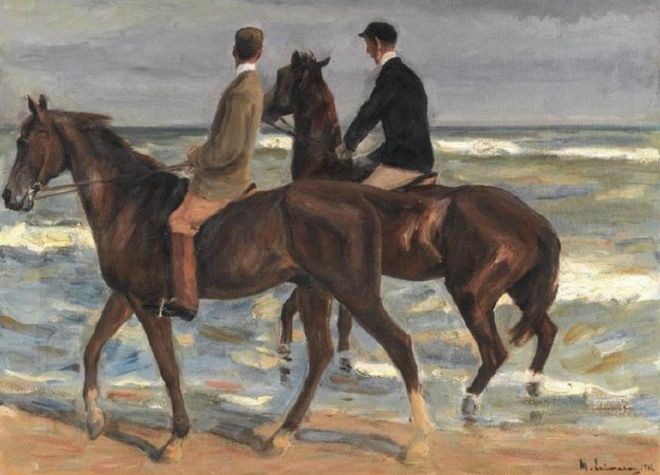 Max Liebermann, “Two Riders on a Beach,” 1901. Ronald mentions Max Liebermann’s Two Riders on a Beach a few times in her book. This painting had been taken from the David Friedmann collection by Hildebrand Gurlitt. 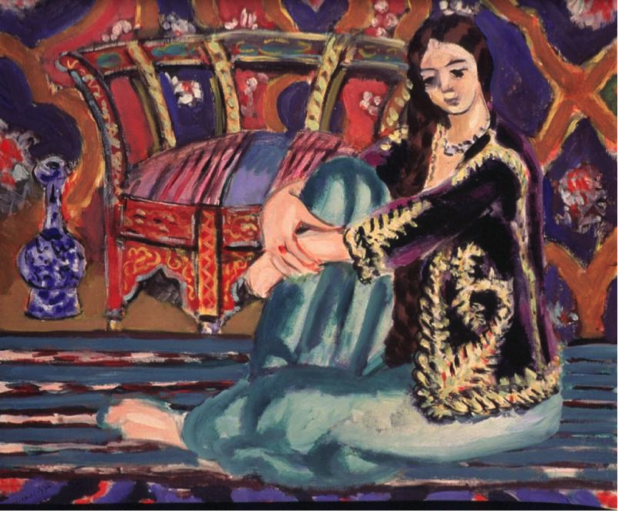 When authorities stormed Cornelius Gurlitt’s flat in 2013, they took this painting off of the wall, where it had hung for over four decades!3 Clearly, the Gurlitt family was proud of this purloined piece. Before that point, Cornelius’ father Hildebrand had hung this painting on his living-room wall in Dresden.4 The painting was returned to David Friedmann’s family. Two Riders on a Beach, was the first of the Gurlitt hoard to go to auction, was sold by Sotheby’s earlier this year in June. 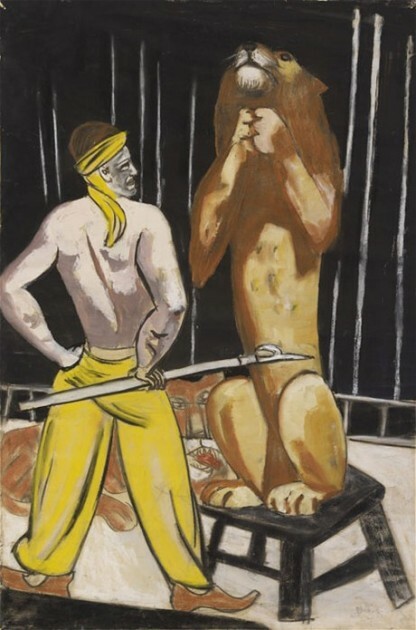 Max Beckmann, “The Lion Tamer.” Gouache and pastel on paper. 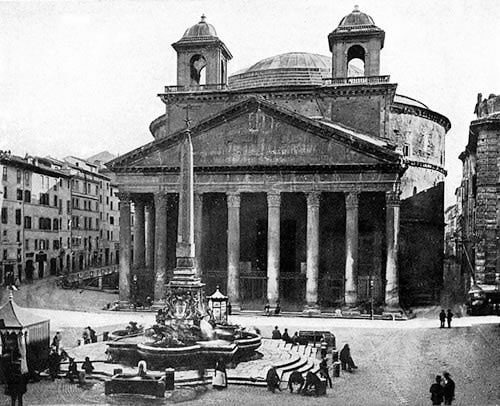 Image courtesy Wikiart. 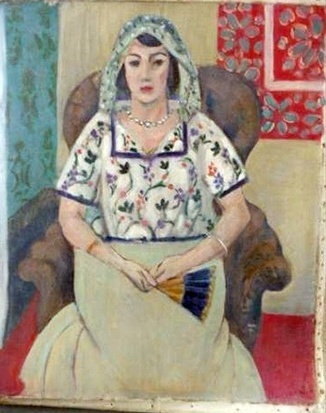 Matisse, “Seated Woman,” “Woman Sitting in Armchair,” or The Seated Woman by an Open Window. 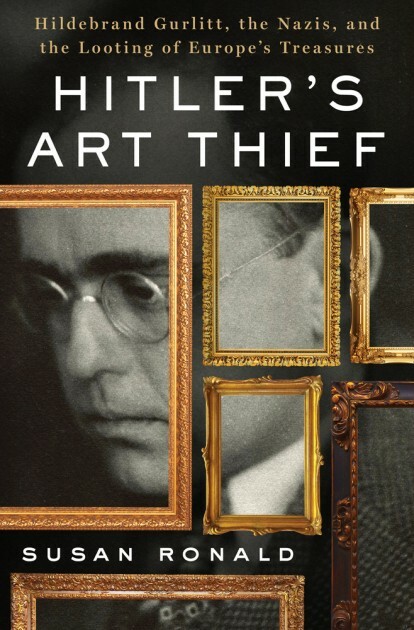 I think that Hitler’s Art Thief is a good book for history buffs and also for those who want a basic introduction to the art looting which took place during the Nazi era. Even as a seasoned art historian (who has read dozens of books and articles on Nazi looting), I learned new things too! And I’m pleased to announce that, through the generosity of St. Martin’s Press, one lucky winner will be able to receive a free copy of this book! 2) Tweet about the giveaway (be sure to include my Twitter name: @albertis_window in your tweet, so I can find it). 3) Write about this giveaway on your own blog or website, and then include the URL in a comment on this post. Thanks to St. Martin’s Press for generously providing an advance review copy and giveaway copy of Hitler’s Art Thief. 1 Cornelius Gurlitt, who died in May 2014, bequeathed his collection to the Bern Art Museum in Switzerland. This action prompted outcry from Jewish groups, and the Bern museum is working to ensure that no looted art appears on Swiss soil. 2 Susan Ronald, Hitler’s Art Thief: Hildebrand Gurlitt, the Nazis and the Looting of Europe’s Treasures (New York: St. Martin’s Press, 2015), 226-229. 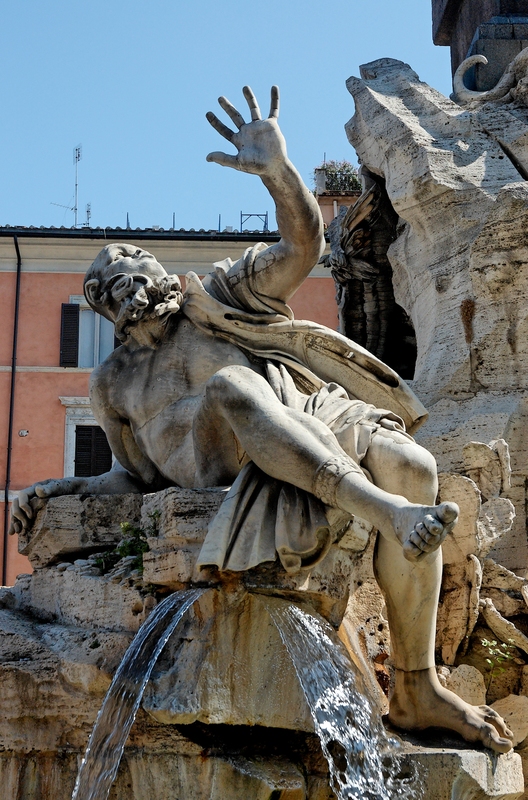 This is certainly the summer for new publications on art crime – and the summer isn’t even over yet! 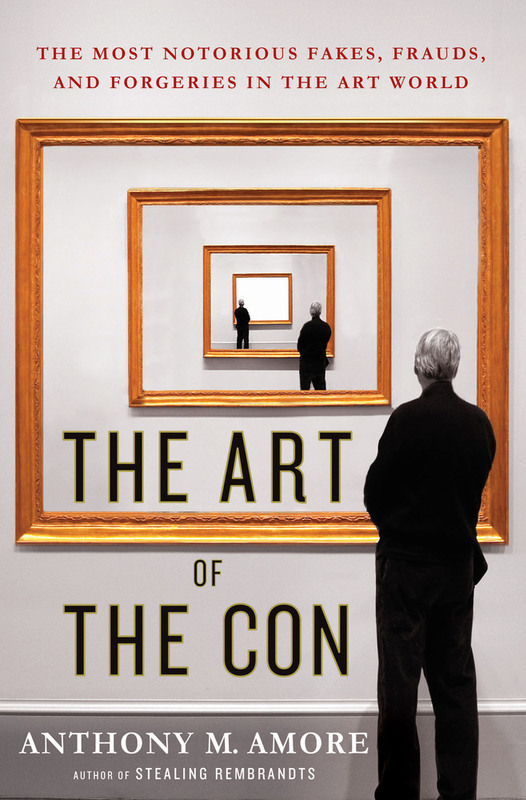 When I learned that Anthony M. Amore wrote a new book called The Art of the Con, I was in the middle of reading another recently-published book on art forgery by Noah Charney. I was curious to see if Amore’s book would be similar in content to Charney’s fantastic book. For the most part, there wasn’t too much overlap between the content of Charney and Amore’s books. 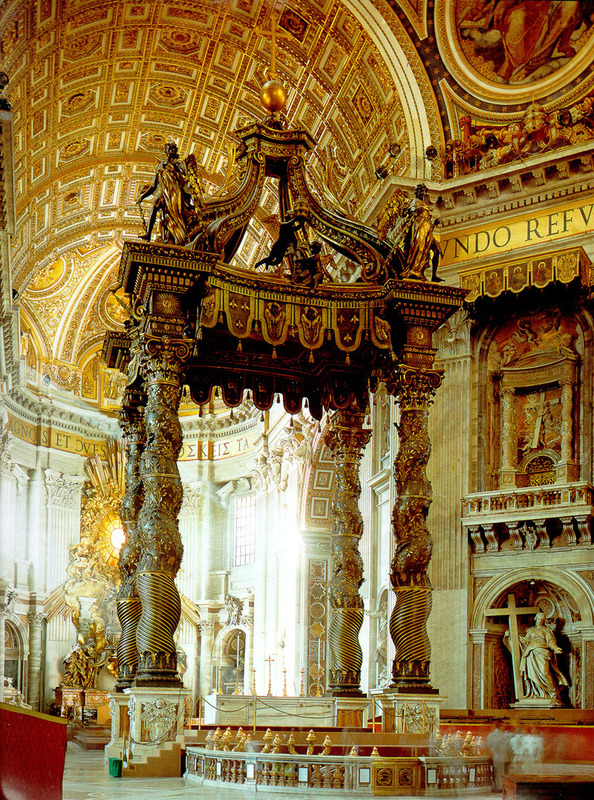 Both authors do discuss the forger Wolfgang Beltracci, but Amore goes into more detail in his book. (Amore dedicates essentially a whole chapter to Beltracci, whereas Charney dedicates a few pages to Beltracci within his broader discussion how forgery relates to different types of crime schemes.) 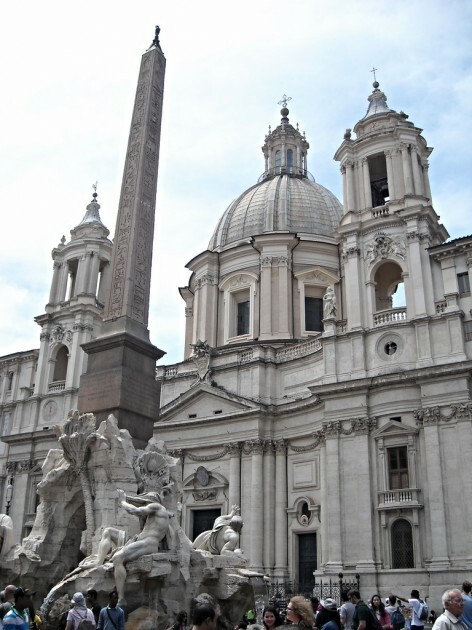 Amore also elaborated on a lot of art cons and schemes that were unfamiliar to me, so I found a lot of the subject matter to be new and riveting. Glass art falsely purported to be by Dale Chihuly, as sold by Michael Little. Image via U.S. Immigrations and Customs Enforcement. Amore dedicates a chapter of his book to dealing with the art con and fraud which takes place online. 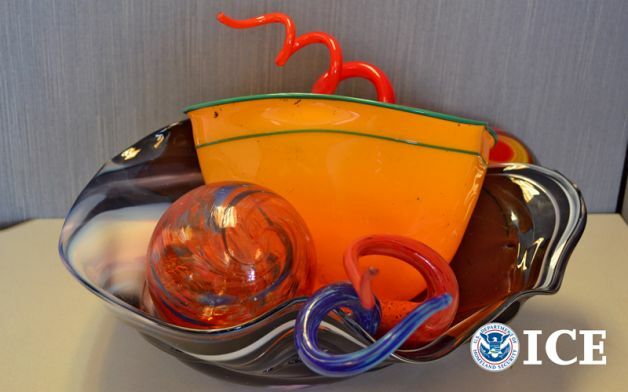 I was intrigued by the story of Michael Little, a man from Renton, Washington, who purported to sell works by Dale Chihuly on eBay (one example of such fraudulent glassware is shown above). Even after eBay pulled Little’s listings after being alerted to the fraud, Little continued to sell the fraudulent glassware online, in person, and through a Renton auction house! One collector was swindled out of thousands of dollars, after he bought pieces that he intended to donate to Gonzaga University’s Jundt Art Museum.6 Little was sentenced to only five months in prison. I later found out, after finishing Amore’s book, that the judge sentencing Little commented that he wished he could also order Little to attend basic training in the Army! Thanks to St. Martin’s Press for generously providing a review copy and giveaway copy of The Art of the Con. 1 For Cezanne reference, see Anthony M. Amore, The Art of the Con (New York: Palgrave MacMillan Trade, 2015), 114. 2 Ibid., 64-65. Other scholars contest Whitfield’s findings that the painting is autograph. 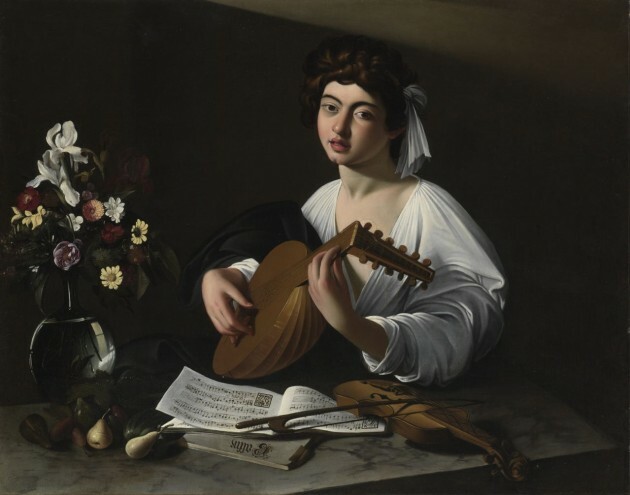 For one example, see footnote 3 in Florian Thalmann, Irony, Ambiguity, and Musical Experience in Caravaggio’s Musical Paintings (University of Minnesota, 2013), p. 4. Lately, in coordination with my volunteer responsibilities at a local art museum, I have been reading What Are You Looking At? The Surprising, Shocking, and Sometimes Strange Story of 150 Years of Modern Art by Will Gompertz. Although a good portion of the things in this book are a review for me, I still am learning several new things, which is fun. I also appreciate Gompertz’s humorous and approachable writing style. This book isn’t without a few minor flaws, however. I am only about a third of the way into the book, but so far I have noticed a few assertions which seem historically unfounded, as well as a quote about Cézanne which was interpreted slightly out of context. But even these slight errors are providing a diversion for me, since they are making me curious in wanting to know more. 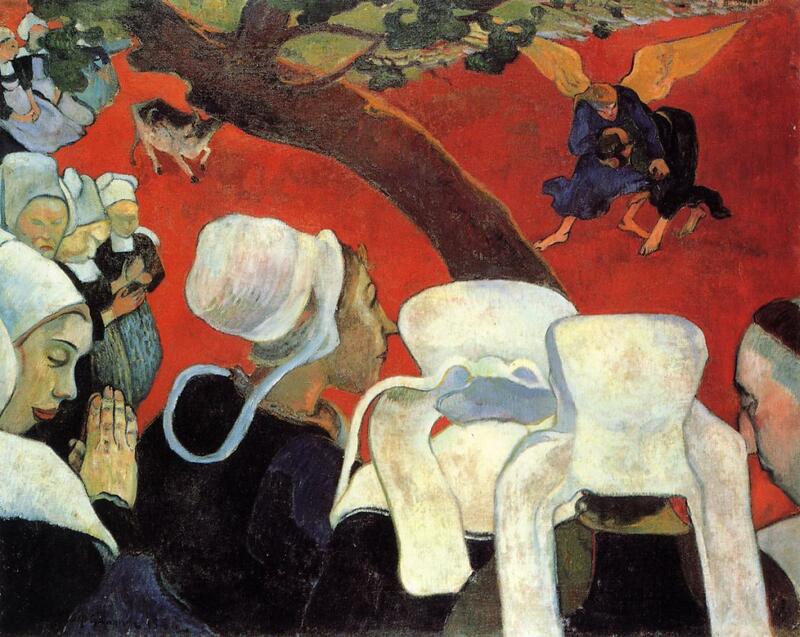 One such diversion for me revolved around Gompertz’s assertion that a scene from Frank Capra’s movie It’s a Wonderful Life was influenced by Gauguin’s painting Vision After the Sermon (Jacob Wrestling the Angel). Gompertz points out that the tree in Gauguin’s painting is used to as a compositional device: the tree is set at a diagonal to divide the earthly realm in the lower left portion of the canvas from the heavenly vision in the upper right (shown below). Gompertz then explains that there is a similarity with this composition and a scene from It’s a Wonderful Life in which George Bailey, who has just attempted suicide by jumping off a bridge into a river, is resting and drying off in a wooden shack with his rescuer, the angel Clarence. 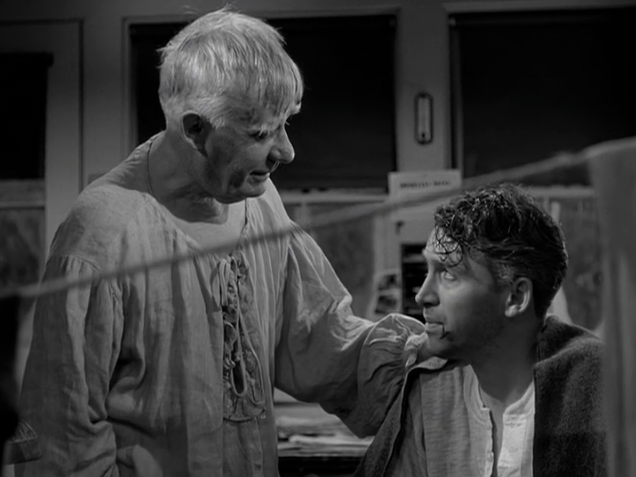 Due to the perspective of the camera, some shots of this scene are divided by the diagonal of a clothesline; this line separates the heavenly angel Clarence from the burdened, careworn mortal George Bailey (see below). I agree with Gompertz that there are compositional and symbolic parallels between Capra’s film and the Gauguin painting. And I appreciate that Gompertz brought this to my attention, especially since It’s a Wonderful Life is one of my favorite movies. My issue, however, is that Gompertz asserts a direct, one-to-one historical relationship between the painting and film. He explicitly states that Capra “referenced this painting” by Gauguin.1 I cannot find any source by Frank Capra or anyone else associated with It’s a Wonderful Life to verify that Capra had Gauguin’s painting in mind when he created his classic film. There is no doubt, then, that Capra thought highly of Gauguin, and it seems like he also liked Gauguin’s paintings, by extension. However, I’m still waiting to find a direct historical connection between It’s a Wonderful Life and Vision After the Sermon, even if a visual connection can be made. If I was writing Gompertz’s book, I would have wanted to point out this visual similarity, but also mention that Capra may have been influenced – either directly or indirectly – by other artistic factors when he considered the set up for this scene with George Bailey and Clarence. I’m particularly reminded of Japanese paintings which use diagonal lines to divide different spaces, such as the division between private and public spheres in a scene from the Tale of Genji (see below). Gauguin’s Vision After the Sermon was definitely influenced by the Japanese aesthetic, but Gauguin wasn’t the only 19th century artist who was interested in diagonal lines (or even trees-as-diagonal-lines, for that matter – see Van Gogh’s Flowering Plum Tree, which is a copy of a Hiroshige print). So, my guess is that several factors are contributing to Frank Capra’s scene. Does anyone have other thoughts or know more about Capra’s artistic influences as a director? Also, do you know of other places in which diagonal lines are used to create a strong symbolic distinction between two types of spaces (such as earthly and unearthly, or public and private)? This compositional device is intriguing to me.